The smell of cinnamon and freshly baked biscuits has gone hand in hand with Christmas since our childhood. Christmas biscuits shaped like gingerbread men or stars have always sweetened our Christmases beautifully. One lovely tradition is when young and old get together at Christmas to bake, creating a contemplative atmosphere in stark contrast to today's fast-paced world. And Christmas would only be half as exciting without sweet treats. Find inspiration in the Villeroy & Boch Christmas bakery and get ideas for your Christmas biscuits. The utensils from our Winter Bakery Delight collection add an extra touch of magic to your Christmas bakery: the intricate motifs of gingerbread, Christmas biscuits and sticks of rock bring back childhood memories and are great motivators to get your wooden spoon out and start baking all kinds of Christmas biscuits. Your homemade biscuits will be given a place of honour on etageres and biscuit plates whereas the biscuit jars with nostalgic Christmas motifs will safely store all kinds of Christmas biscuits until they land in the mouths of your sweet-toothed loved ones. Christmas time is biscuit time. Does the smell of Christmas biscuits also take you back to your childhood? Then pass this tradition on to your nearest and dearest. Dough and other sweet ingredients often get eaten while baking delicious treats together for Christmas – if little foodies are allowed to help with the baking, then they will turn into master bakers in no time at all. Baking biscuits with children at Christmas can be easy: choose recipes with ingredients for quick and simple Christmas biscuits where your little helpers can stir, knead and roll out the biscuit dough themselves. We have put together delicious Christmas biscuit recipes for you to bake for Christmas: vanilla crescents, honey gingerbread, simple cut-out biscuits and more. You will find the right Christmas tableware to spruce up your favourite Christmas biscuits in our Toy's Fantasy collection. Christmas baking has never been so easy. In addition to traditional Christmas biscuits, these quick and original Advent cakes are also popular during the festive season: mug cakes. 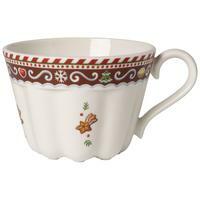 Cups from the Winter Bakery Delight collection are used as Christmas baking moulds. Simply pour the batter into the cups, bake in the oven and enjoy! Find all Christmas items and great gift ideas in our online shop.